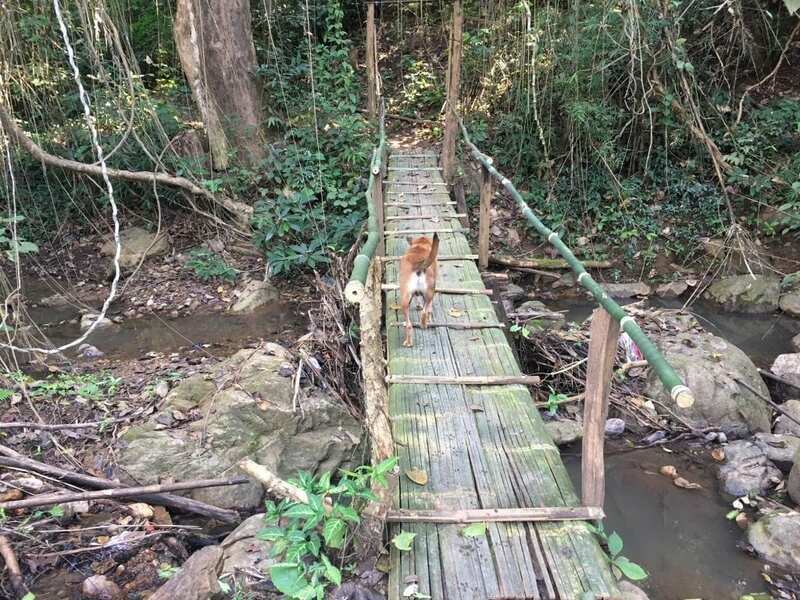 On Day 7 of The Tuk Tuk Thailand Diaries, Mark goes off in search for some white flowers and gets led down the garden path by a pack of dogs while Jen takes another day of rest. Today might be a day off for Jen and her tuk tuk friend Flo, but there is no respite for their passengers. 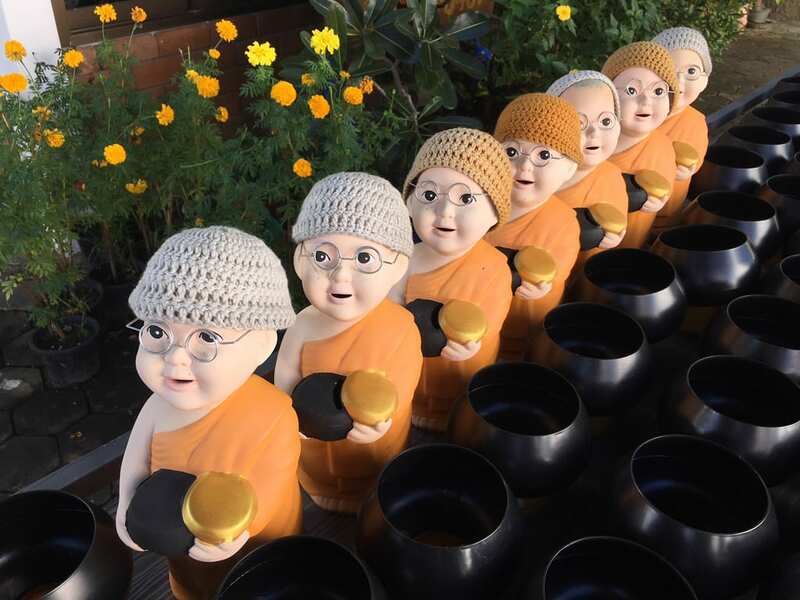 The day starts with a gentle stroll – up 300 steps – to Wat Phra That Doi Kong Mu, that affords great views of Mae Hong Son, as well as the strangest looking offering monks (see main photo). Like many temples in the region, Wat Phra That Doi Kong Mu is not as old as it might at first seem. 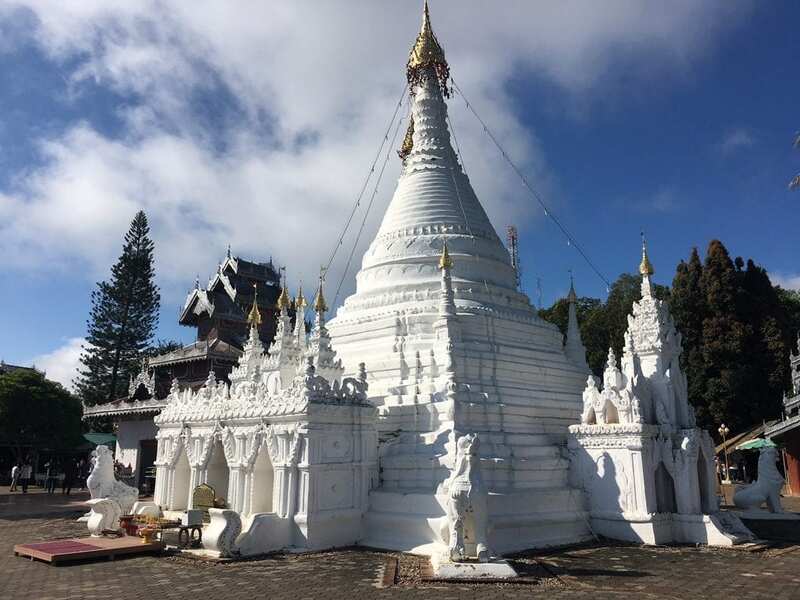 Built in the Thai Yai architectural style, the two main stupas date to 1860 and 1874. At some 1,300 metres above sea level, this is a great spot to watch the aircrafts take off and land from the surprisingly busy provincial airport. The rest of the morning we spend searching for some white flowers. At the start of our trip the monk at Wat Tham Nam Hoo had given us some candles to burn while making a wish for our journey. The only problem was that we each needed nine white flowers in order to perform the ceremony. Smith had planned to buy some white chrysthanthenums from local farmers on our trek on Day 4, but the flowers were not yet in bloom. Unfortunately, Mae Hong Son is very much a yellow flower kind of town, as our brief excursion confirmed. Eventually, we found some white flowers at the local market, only to discover a white flower shop as soon as we had made our purchase – isn’t it always the way. Despite the inviting prospect of spending our day of rest lazing by the pool, we opted to hike a trail that lead from the back of Fern Resort. Now, the weirdest thing about the walk was our guides. As we assembled at the starting point, the owner of the resort clapped his hands several times and four dogs appeared. They scampered off down a path and we duly followed. How difficult could the walk be? I asked. After all we were being led down the garden path by our four-footed friends. An hour or so later as we were scrambling up and down some rocks and traversing stepping stones either over or though a stream, I had discovered the answer to my question. In truth, I felt most at home on the short trek. And I didn’t even get my feet wet – apart from when I plunged into a pool next to a small waterfall. As I eased myself closer to it, I felt the refreshing waters resurrect my soul. This was the reason I fell in love with travelling in the first place. Rachael probably wouldn’t have agreed with me – at least not at the time. This was her fiftieth birthday. As she slid her way down the slope we had just climbed, having realised we had wandered off in the wrong direction – I blame our guides, all four of them, who were much more interested in rummaging in the undergrowth – I think she doubted she would ever make it to fifty one. Still, we survived to celebrate her birthday. 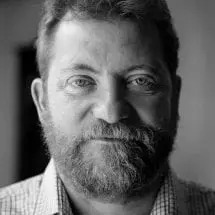 And as the bottle of champagne that Graham had been carting around in the back of his support vehicle for the last week was opened, all thoughts of her near death experience were banished form our minds. Then came the ceremony. Rachael divvied out the white flowers and the candles and we decamped to one of the bonfires in the resort’s grounds. Then we lit the candles and placed the flowers beside them, as one of our four-footed guides joined us. It was actually quite a moving experience, although whether my wish will come true only time will tell. As for The Tuk Tuk Thailand Diaries, tomorrow we get back on the road and head to Pai on what promises to be one of the most spectacular day’s driving. 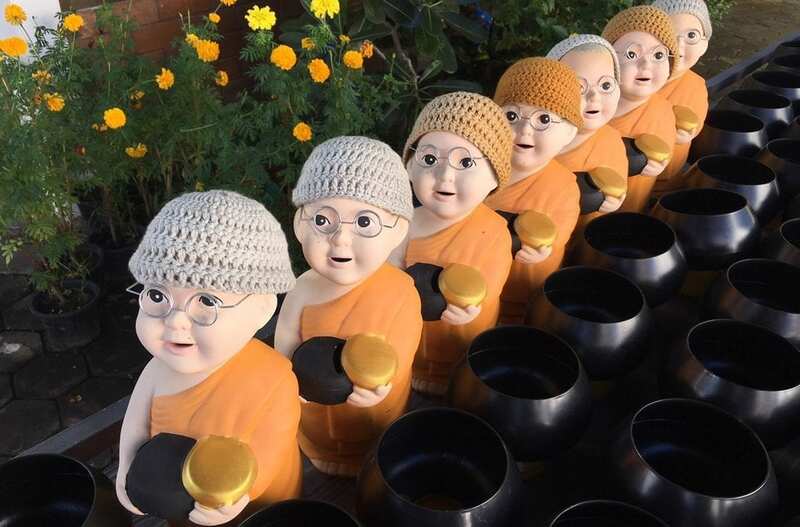 Read Mark and Jen’s previous adventures on The Tuk Tuk Thailand Dairies, here. To get more information on how to get off the beaten road with The Tuk Tuk Club, click here.